Do you need to measure your wireless network strength? Well, check this list of the best tools to measure wifi signal strength. Although when you are at home or work, you can connect to the router via Ethernet cable, most users prefer to use the WiFi connection for convenience. However, when you go out on the street, you rely on WiFi networks to be able to count on the Internet on your laptops. Therefore, you will show some apps with which you will be able to measure the intensity of the WiFi signal of each of the networks around you to connect to the one with greater strength. Besides, they can be handy tools when you want to know the best place to connect the router in our house and avoid that some corners are without WiFi coverage to connect from that point of the house to the Internet. By measuring the Wifi signal strength, you can determine the place where better coverage arrives and where the signal weakens. 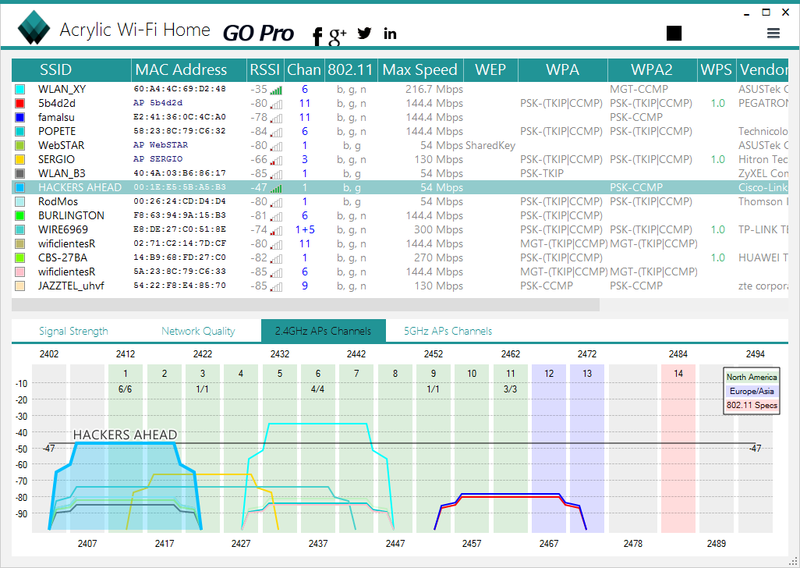 NetSpot is a tool to measure wifi signal strength for Microsoft Windows and macOS, which will allow you to analyze all the Wi-Fi networks around you, showing you a large amount of information about them. For example, you can see the signal you receive, the channels used by different wireless networks, if there is interference, noise, and much more information to optimize the Wi-Fi network to have the best possible Wi-Fi signal. NetSpot has a “discovery mode,” which aims to visualize all the details of the Wi-Fi networks around you, presenting the data as an interactive table. All the data we receive is in real time, and if new Wi-Fi networks appear, these changes will also be reflected in the program. You will be able to see the individual configuration of each of the AP, graphics in real time, and even supports the 2.4GHz and 5GHz band simultaneously (it is mandatory to have a Wi-Fi dual band card. Otherwise we will see 5GHz). We will also be able to compare the different APs in terms of received signal easily, and even export the information to CSV format for later analysis. This program also has a ” Wi-Fi analysis ” mode, where you will have the possibility to upload a floor plan and physically locate the different access points, to check if you are going to have wireless coverage throughout your home. 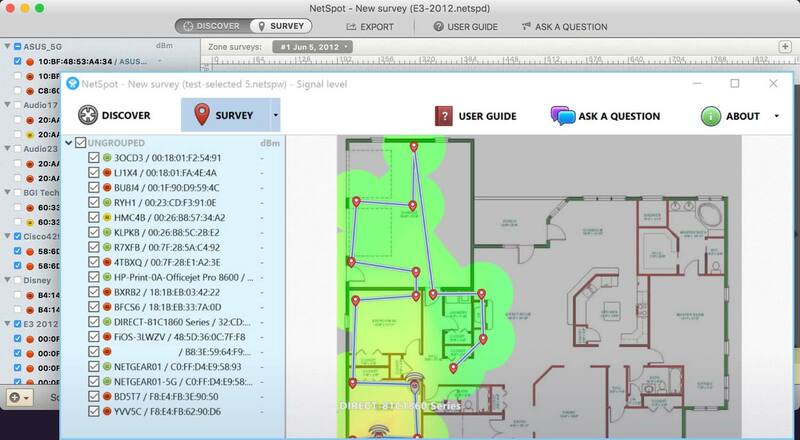 In the heat maps, you will be able to create multiple zones in a single project, in addition, you will be able to see detailed information of all available Wi-Fi networks, create snapshots to later compare them with other configurations, ad-hoc recommendations to improve the configured network , and you can also export the data to PDF or CSV. 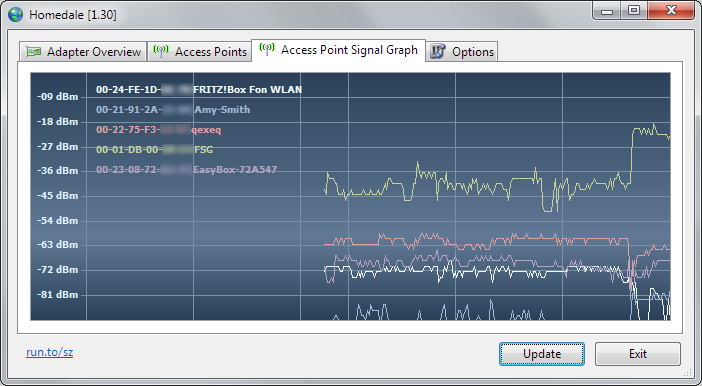 Another free tool that allows you to measure the wifi signal strength. Homedale is a straightforward tool to use, and its interface shows us the WiFi signal strength of all the wireless networks around you along with a frequency chart and a location detector to send the exact position using Google maps. In addition to seeing the WiFi signal strength of each network around you, it will also provide you with its SSID, MAC address, signal strength, etc. Although it may not seem like it, setting up and configuring a Wi-Fi network that guarantees a high connection speed and proper coverage is a very complicated task since many factors influence it, such as the networks that exist around it and the channels in which they transmit these. To help you configure your network as best as possible, and at the same time to know the digital environment in which you live, you must use software that makes us a Wi-Fi network scanner and, in turn, helps you to configure the best possible this, as is the case with Xirrus Wi-Fi Inspector. 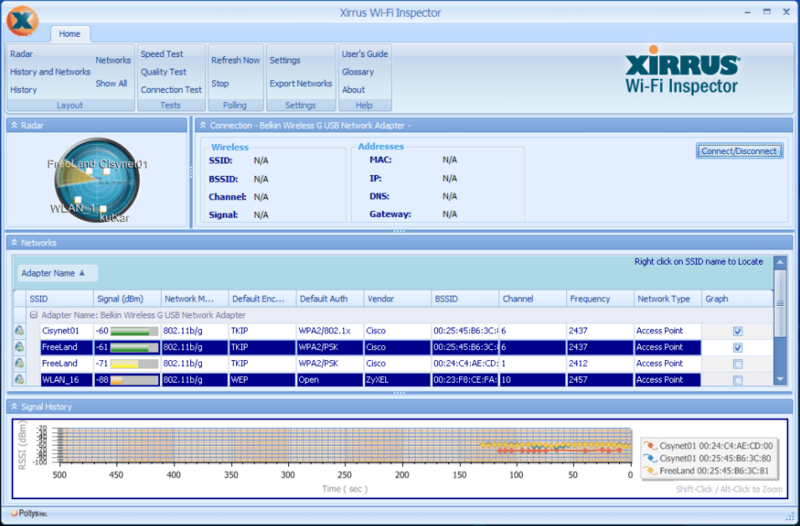 Xirrus Wi-Fi Inspector is a free Wi-Fi network monitor designed to identify all the Wi-Fi networks you have at your disposal. You will be able to carry out the different configuration tasks (channel, SSID, password, etc.) depending on the networks around and help us to enter the best place to place your router and guide the antennas of the same to get the highest possible speed. Acrylic WiFi is the best tool to measure wifi signal strength and also check their security. This program is developed by the Spanish company Tarlogic and is compatible with the latest Microsoft Windows operating systems, including of course Windows 10. Thanks to this Acrylic WiFi program, you will be able to verify all the available Wi-Fi hotspots on your surroundings, and in fact, will help you to configure the best emission channel in your router, to obtain the best Wi-Fi coverage and speed in our home. You have the Acrylic WiFi Home version, and also the Acrylic WiFi Professional version. However, you have at your disposal an Acrylic Wi-Fi Heatmaps version that will allow you to make complete heat maps of Wi-Fi networks, ideal for comprehensive studies of coverage in hotels, universities or open spaces. And finally, you have the Acrylic WiFi Law Enforcement version, a tool that is specifically designed for security forces, and that will allow us to research a non-intrusive way, and control potential objectives, detecting them and monitoring them in detail. This version Acrylic WiFi Home is specifically aimed at home users who want to know all the access points and Wi-Fi routers around them. This program is entirely free for non-commercial use and is one of the most advanced since it will allow you not only to see the AP around you, but the signal received by them over time, and check if we have had any wireless cut or Wi-Fi signal drop. Today, almost 93% of users connect to the Internet through Wi-Fi networks, either from computers or mobile devices. The problem with these networks is that, in addition to being slower than wired networks, they are tremendously affected by external agents (such as interference) that can be done from more time-consuming than usual to lose connectivity to your network completely. Therefore, to solve these problems and be able to make the most of the waves of our network, it is possible to use tools, such as dot11expert, to know your environment, measure your wifi signal strength and thus be able to choose the best configuration for our network. dot11expert is a simple tool developed by KC Softwares (a company known for creating other applications such as SuMo and KCleaner) to help users identify and solve all problems related to Wi-Fi networks in the home. This tool is responsible for showing us detailed information about network adapters, Wi-Fi networks and access points available near our position. This tool will show you all the possible information of the networks within your reach, such as the signal quality, the SSID, the MAC, the channel, the type of authentication, etc. This tool also let you analyze the connectivity problems, help you to choose the best possible configuration and even to place our router or access point in the best place. So far those were the best tools to measure wifi signal strength easily on Windows. You only need to download any of these tools for free. Do you use another tool to measure wifi signal strength? Let me know in the comments section.